This is the crazy thing about living in a city of four million people for years and years, there are parts of town you had no idea even existed. I had no clue there had been a $34 Million dollar makeover to the old Tram Depot on the fringe of Harold Park near Glebe. The new precinct is now called ‘Tramsheds’ and it’s a foodie’s paradise. Full of butchers, bakers, Providores, wine bars, Restaurants and nearby new apartments it’s the proverbial hive of activity. 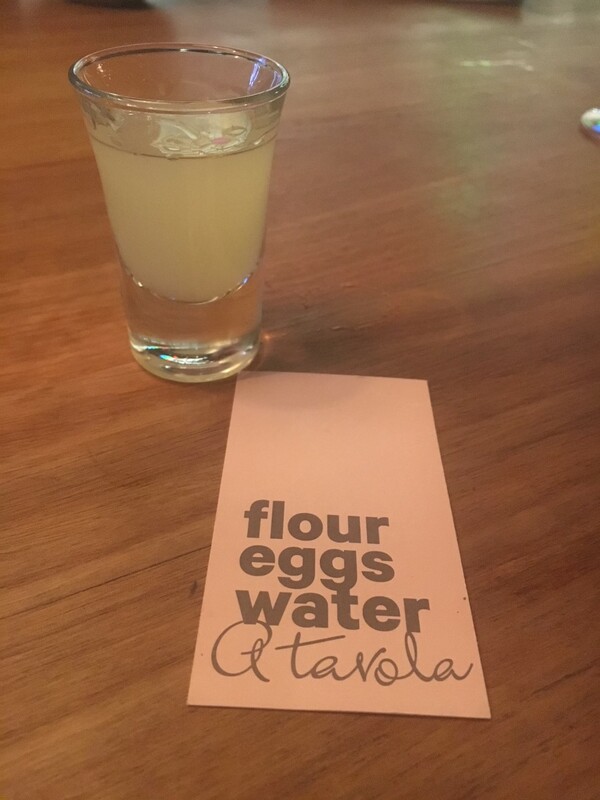 Nestled in the belly of this brand new project is ‘Flour Eggs Water’, another offshoot of A Tavola, the other 3 Tavola’s situated in Darlinghurst, Bondi and Surry Hills. 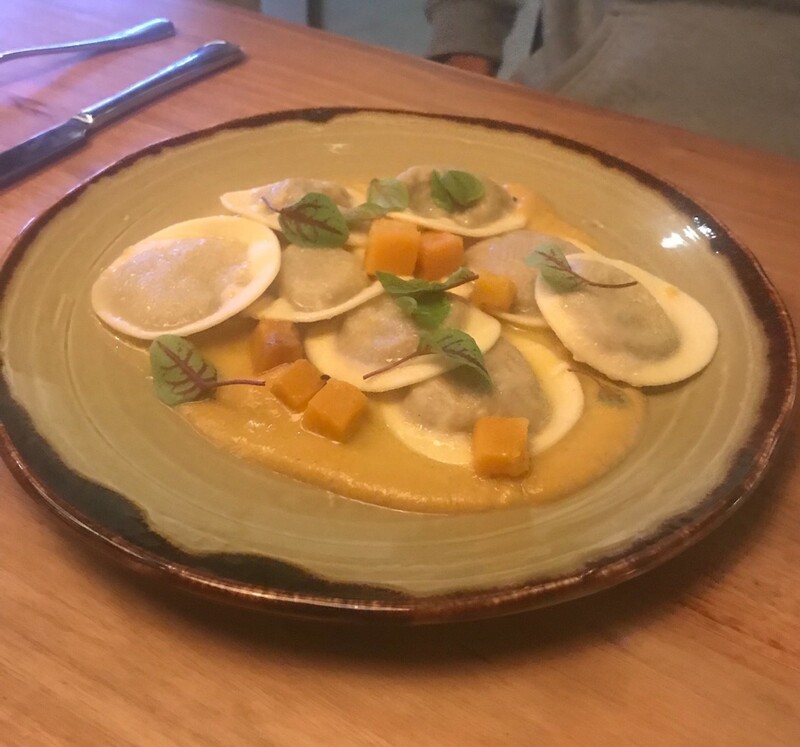 They are the brainchild of Chef/Owner Eugenio Maiale, who as a child constantly heard ‘a tavola’ around dinner time which means ‘to the table’; his Mother’s love of homemade pasta was passed on to Eugenio. So it’s on a lazy Wednesday night that Bun, Cam and I head down to the Tramsheds to see what all the fuss was about. It’s not crowded when we arrive but soon fills up nicely. A bottle of Rabbit Ranch Pinot Noir from NZ is ordered and we are off and running. 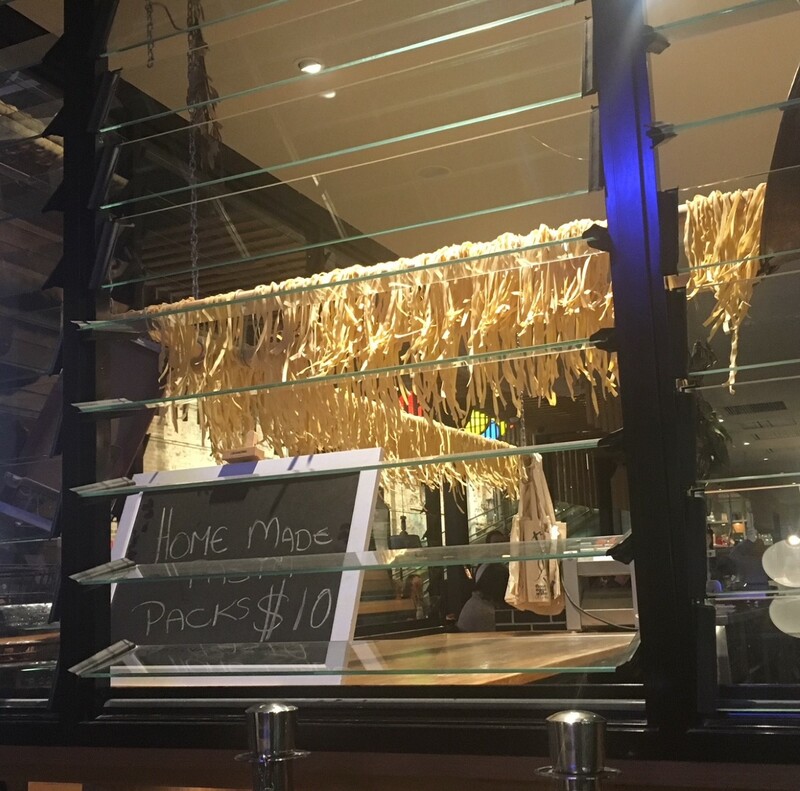 The menu obviously is pasta based and if you wanted to jump into the antipasti’s you could, they included oysters, baked olives, calamari and a few other temptations but we are here for homemade pasta. 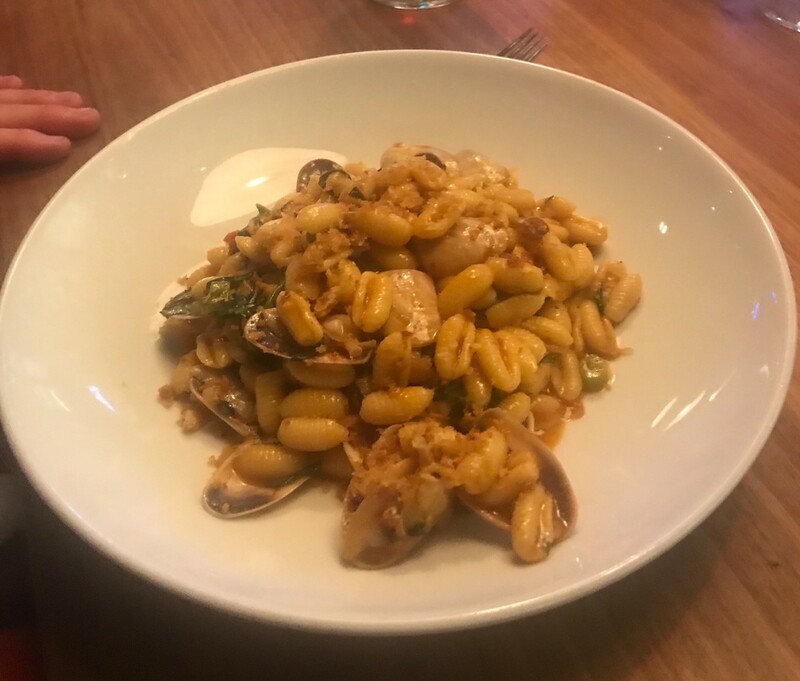 I had a ‘special’, the Malloreddus (little Sardinian gnocchi) with Pipi’s (little shellfish), nduja (spicy Italian pork salami) cime di rapa (green winter vegetable) sprinkled with breadcrumbs; it was in a word ‘incredible’. The ‘gnocchi’ wasn’t gnocchi as you’d know it, but like a small seashell shape cooked to al dente perfection, mix that in with the spicy pork, the winter vege and the subtle crunch of the breadcrumbs and you’ve got angels singing. Bun orders the Mezzelune pasta with ricotta, spinach, crab and mint. 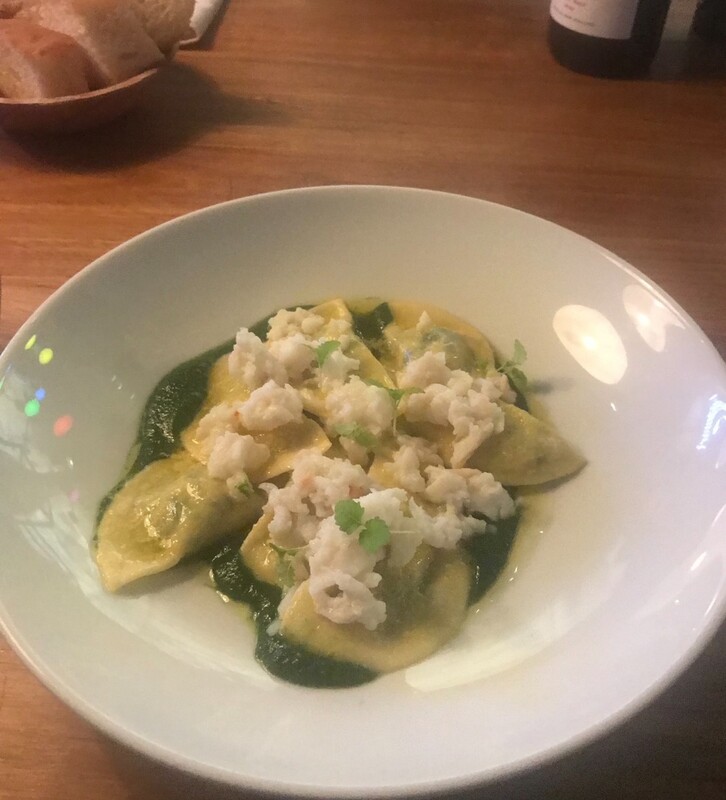 ‘Mezzelune’ literally means ‘half moon’ which really means you can fill that pasta shell with all kinds of goodness, which has happened here, mix that in with the crab meat resting on top and that subtle mint flavor and we have a winner, “amazing” was the word Bun used. Cam being the meat lover that he is orders the Ravioli with wild boar, pumpkin and taleggio, and the verdict straight from the source “delightful, perfectly cooked pasta with tasty gamy boar, it was like pulled pork but only real meat instead, pumpkin was perfect in complementing the Ravioli, a superb dish all round, I could eat it every night of the week”, now that’s high praise. We all decide desert is a bridge too far but as is customary I finish things off with a limoncello, that’s the Italian way. 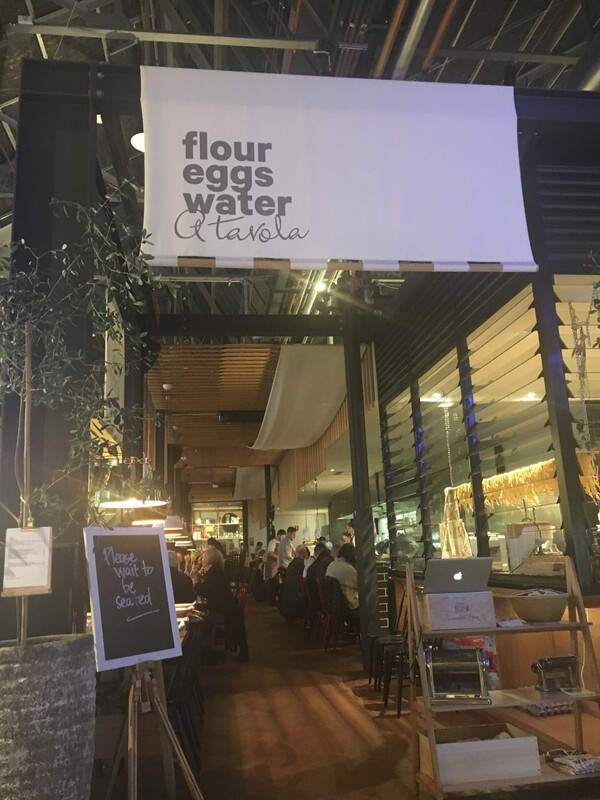 As a restaurant its a narrow long space and depending on which way you face you’re watching the kitchen work its magic or the workday commuters coming down the escalator from the light rail station, either way is an interesting watch. Summary: Sydney of course is overflowing with Italian joints, if you went out into your front yard right now and threw a cannoli in any direction you’d probably hit an Italian Restaurant, that being said A Tavola is one of the best, I’d recommend if you can come to Tramsheds for a feed do it during the week, as on weekends it’s a bit crazy and parking is limited but if you make the effort your tastebuds will be joyous. You go go go, have to try deserts next time. You bet Libby, we’ll give it a run.